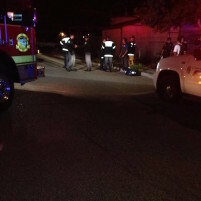 A bicyclist survived a hit-and-run collision with a vehicle in Grover Beach Thursday night. The bicyclist only suffered minor injuries but was taken to the hospital, according to the Grover Beach Police Department. Police are still searching for the driver. The collision occurred at 16th Street and Mentone Avenue. Police say a male driver fled at high speed in a dark-colored four-door Subaru sedan with right front bumper damage. He was last seen heading eastbound on Mentone Avenue into Arroyo Grande. The driver is described as having curly or puffy hair. Grover Beach police ask that anyone with information call (805) 473-4511. Last year, San Luis Obispo County ranked fifth among California counties for the most bicycle collisions per capita. SLO County was also the statewide leader last year in bicycle fatalities per capita. According to the Tribune article on this, the incident occurred at about 11:00 p.m. Not a great time to be riding around on a bicycle. Yeah, that’s about the time people are heading home from the bars, restaurants, clubs, and wine tasting rooms. Not a great time to be on the streets in general. If the driver of the car did nothing wrong, he would not have fled the scene. “A lot of the time?” You have some personal experience that qualifies that statement? One is pretty much a Class ‘A’ Douchebag for having had, and DRIVING on a suspended license. Read my post again, then, if you can actually comprehend what I wrote, respond. If not, don’t bother. Your response completely ignored what I actually said. So no stats to support “A lot of the time?” instead some passive aggressive personal attacks to support your theory? “Stay Classy”? What is that supposed to mean. How about addressing the fact that “Bob” did not respond at all to what I actually posted, instead, went off on a thinly veiled attack of his own. “A lot of the time” is NOT specific, how are there supposed to be stats to support that? Now if I threw out a specific number or percentage, then I might be expected to back that up with stats. You AND Bob need to regroup and then address what I actually wrote. Bob still hasn’t. Side_Show_Bob says:”You have some personal experience that qualifies that statement?” is a question to you Perspicacious, that you did not answer. “if you can actually comprehend what I wrote” Personal attack. “if you can…….respond. If not, don’t bother. ” Passive aggressive jab. “Your response completely ignored what I actually said.” Just like you ignored what he said. “You AND Bob need to regroup and then address what I actually wrote. ” No, I don’t know bob so group never happened and if perhaps you would converse with people instead of insults and orders you could have a discussion about facts and real things you care about. “A lot of the time, the driver who flees did nothing wrong to cause the accident, but they had a suspended license” I think the fact that they got behind the wheel of a car is the first thing they would have done wrong…..
You are also missing my point. If someone runs out in front of a car or darts out in front of a car on a bicycle, the COLLISION is the pedestrian or bicyclist’s fault, NOT the drivers fault. I NEVER said the driver did NOTHING wrong EVER. I only said he did not specifically cause the accident. Which wine tasting rooms are open until 11pm?